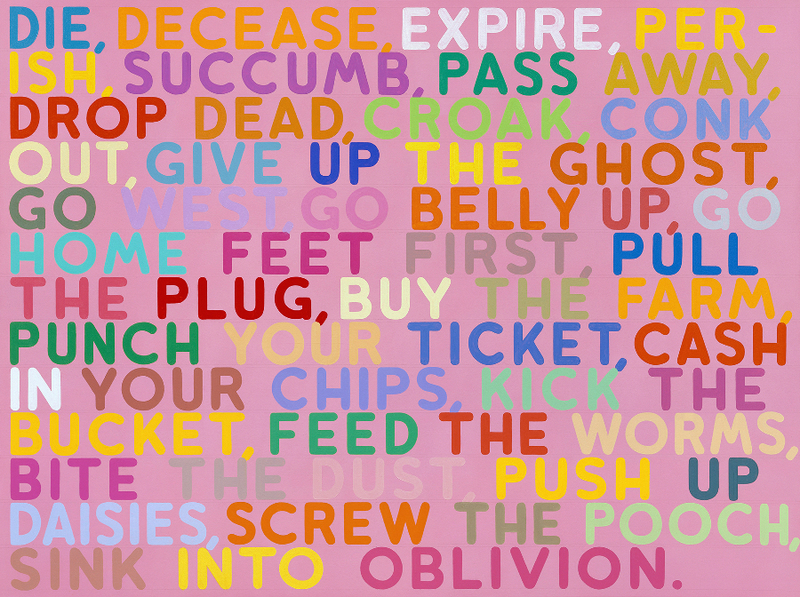 As Mel Bochner tells it, his longstanding engagement with language was inevitable. His seminal “Working Drawings and Other Visible Things on Paper Not Necessarily Meant To Be Viewed as Art” (1966) — a collection of notes and drawings from the likes of Dan Flavin, Alfred Jensen, Eva Hesse, Sol Lewitt, among others, photocopied and arranged into four identical binders — considers the rules and seriality of communication systems, if not written language directly. At the time, the work signaled a broader paradigm shift toward Minimalism and away from Abstract Expressionism and Pop Art, while also heralding the text-based work that would come to occupy Bochner for much of the next 45 years. Robert Rauchenberg’s telegraphed Portrait of Iris Clert (1961) and early abstract portraits by Frank Stella are listed as major influences in the development of Bochner’s conceptual Portraits series. So is the shaped poetry of George Herbert (1593-1633) and Guillermo Apollinaire (1880-1918), and an essay written by Charles Boultenhouse (1926-1994) titled “Poems in the Shape of Things,” published in 1959 inArt news annual. 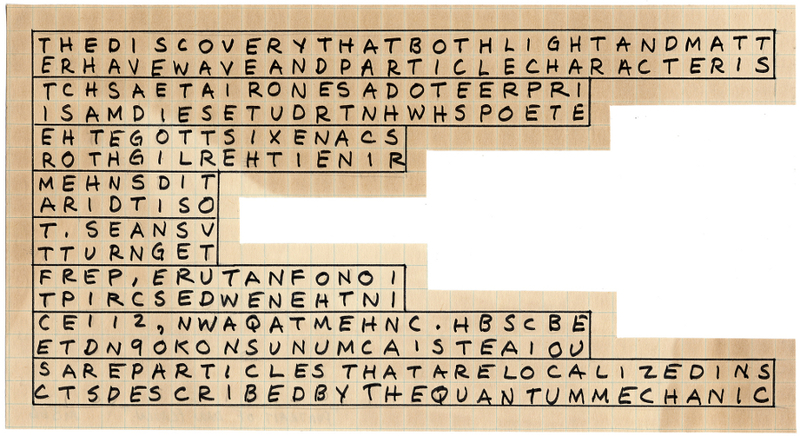 But unlike Apollinaire and Herbert, Bochner’s original interest in text was removed from poetics or literary narratives. Instead, synonymy and other systematic processes were used to objectify language into the visual sphere in works that took distance “from the humanistic stammering of Abstract Expressionism, Happenings and Pop art” of the time. 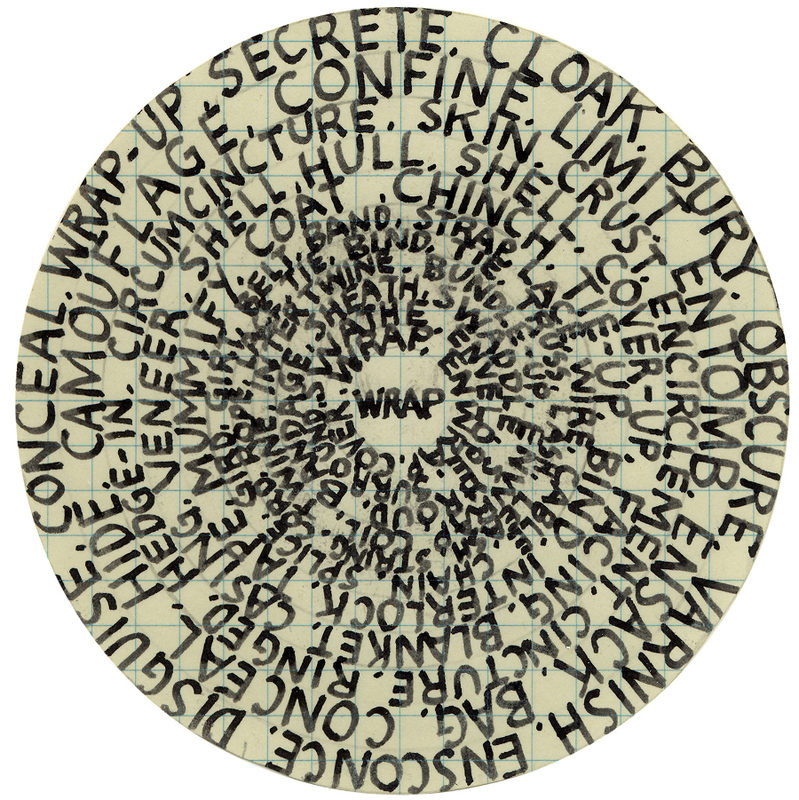 Fast forward some forty years and Bochner begins revisiting his early thesaurus drawings with Wrap: Portrait of Eva Hesse in 2001. 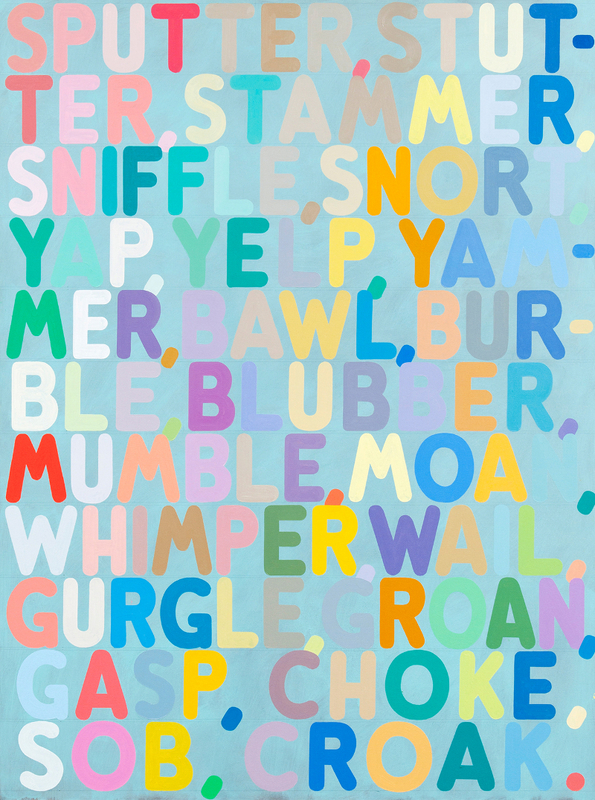 Two years later in 2003 — and 23 years after he started painting — Bochner completes Unnamable, the first of his Thesaurus Paintings. With this piece, the artist begins to consider how color and a painterly affect can influence the way we perceive meaning, an idea he will continue to fine tune — and noticeably so — with each subsequent iteration of the series. Indeed, painterly subjectivity, which entered Bochner’s work through “Conceptualism’s back door,” becomes so significant in his abstractions that it’s not difficult to wonder if the resulting works may be a signal of a broader paradigm shift once again. 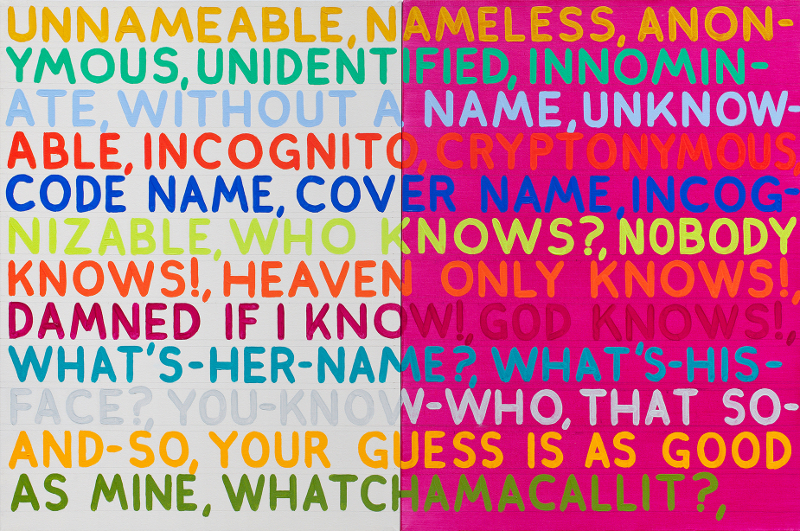 Mel Bochner (American, born 1940) received his BFA from the Carnegie Institute of Technology in Pittsburgh in 1962. 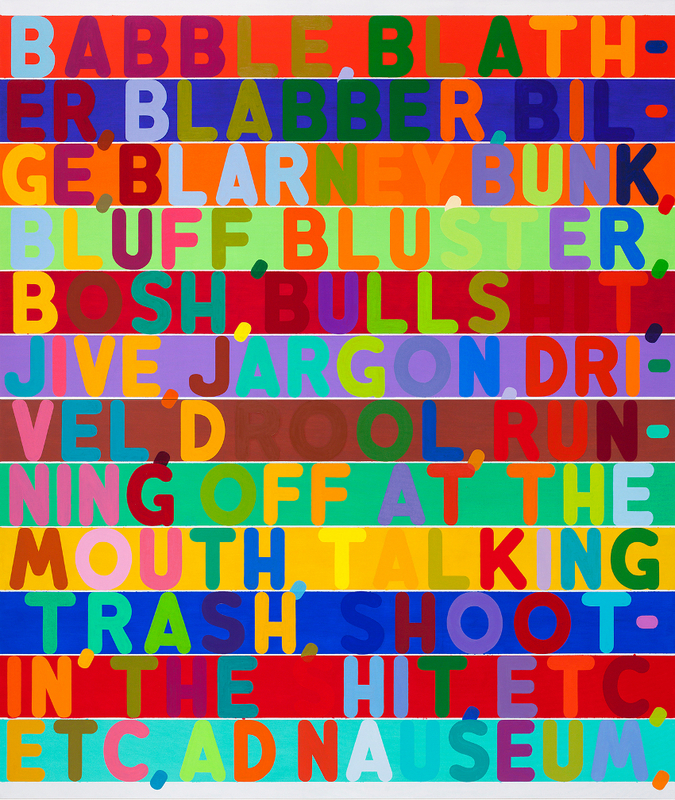 Shortly after moving to New York City in 1964, he became involved in two of the major movements of the period–minimal art, which was already being developed by artists such as Donald Judd, Dan Flavin, and Sol LeWitt, and conceptual art, a then-nascent movement of which Bochner would become a key figure. In 1966 he organized the exhibition Working Drawings And Other Visible Things On Paper Not Necessarily Meant To Be Viewed As Art at the School of Visual Arts, New York–a show that is now considered to be one of the first conceptual art exhibitions. The same year Bochner began making photo works, including his important 36 Photographs and 12 Diagrams, which was exhibited at Dwan Gallery, New York, in 1967. In 1969 the artist created his now-famous Measurement: Room at Galerie Heiner Friedrich in Munich, Germany. 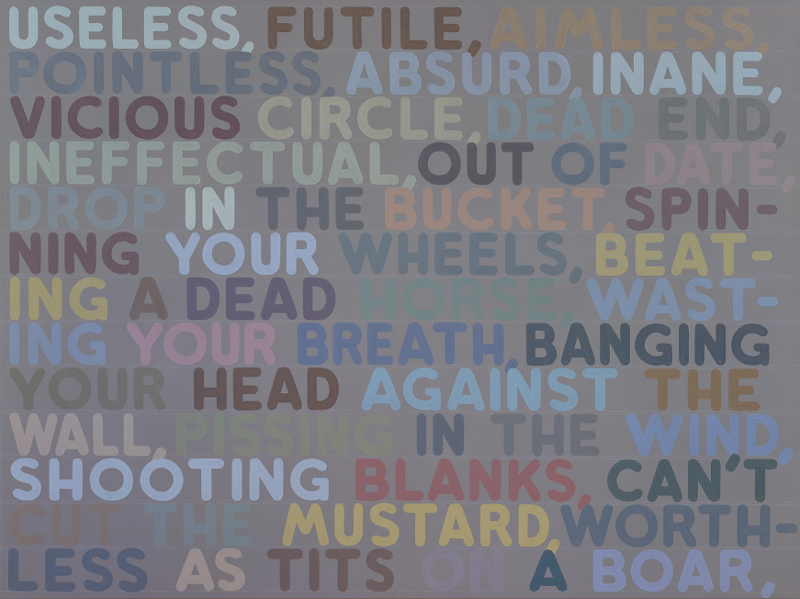 As both an artist and critic, Bochner has served as an interpreter and interlocutor for many other artists of his generation. His early writings, including “Art in Process–Structures” (Arts Magazine, 1966), “Serial Art Systems: Solipsism” (Arts Magazine, 1967), and “The Serial Attitude” (Artforum 1967), all attempted to elucidate some of the fundamental ideas at work in minimalism and early conceptualism. Major exhibitions of Bochner’s work include Mel Bochner: Thought Made Visible 1966-1973 at the Yale University Art Gallery in 1995; Mel Bochner: Photographs 1966-1969 at the Harvard University Art Museums in 2002; and Mel Bochner: Language 1966-2006 at the Art Institute of Chicago in 2006.